Is there something you’ve been waiting for for a long time? Maybe it’s your future husband, or some medical breakthrough, or an advancement in your career. Maybe you’ve been trying unsuccessfully to have a baby. Or maybe you have a dream – some passion that’s been smoldering inside of you since you were young. Sometimes the thought of it hurts your heart a little. You try to bury it so you don’t feel, but you can’t bury yourself. 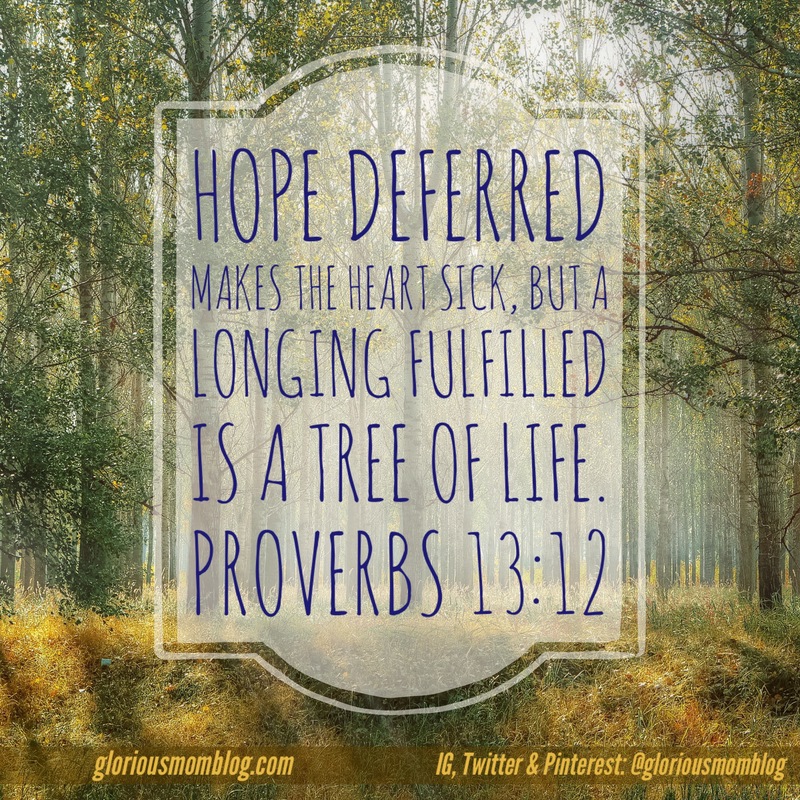 Proverbs 13:12 says “Hope deferred makes the heart sick, but a longing fulfilled is a tree of life.” So how do you wait for the desire of your heart without getting heartsick? I knew I wanted to lead worship by the time I was thirteen. I also knew I wanted a family at a young age. Really wanted one. Like now. I didn’t start leading worship until almost ten years later. I didn’t get married until I was twenty-seven. I also spent a good amount of time in the Cardiac Intensive Care Unit waiting to see if my son would live, and whether or not he would be sent home with an NG tube. More about that story here. So I know a little about waiting. Isaiah 40:13 says, “but those who wait on the Lord shall renew their strength. They will mount up on wings like eagles; they shall run and not grow weary, they shall walk and not be faint.” So what is the difference between letting hope deferred making you heartsick and being strengthened by waiting on the LORD? The distinction between the two is this: what are you doing while you wait? Are you obsessing over your circumstance, or are your eyes fixed on God, trusting that He has your future in His hands? Why is waiting even necessary? Clearly the thing you’re waiting for is a good thing, right? 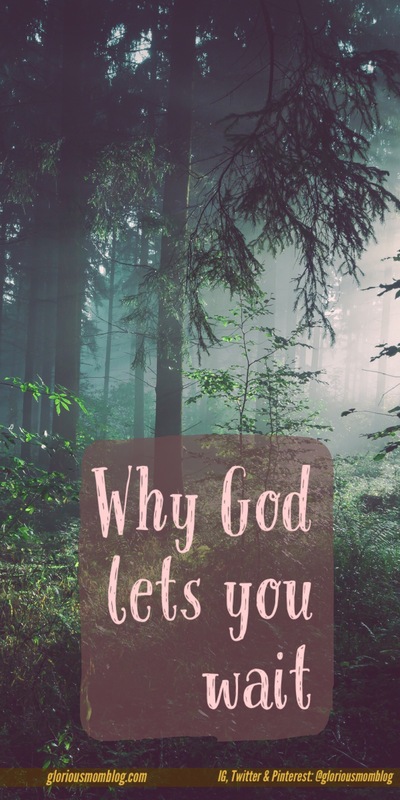 Why would God withhold it from you? Why not just let you have it now? Why the delay in answered prayer? The Bible is filled with characters who had to wait for their desires. Abraham waited for God’s promise of a great nation, Hannah waited for a son, John the Baptist and Jesus were called to greatness at a young age and yet waited until the appointed time to enter their ministry. The reason God makes me wait is this: He has a fabulous destiny for me that is greater than I can imagine, but my heart isn’t ready for it. I’m not ready. First of all, I have a thousand little character flaws that are getting ironed out in the process of me not getting what I want instantly. Second, don’t you know that what you want is not always what you expect? I waited years for a husband, not fully understanding that God was going to use my relationship with this amazing man of God to shape me further into His image, because boy, is marriage work! The things that I’m waiting for (with my eyes fixed on God) I’m not ready for. I need to wait. I need to mature and grow. God’s faithfulness is steady and unchanging. He sees me and knows me and He knows the seasons. When the time is right, He will fulfill His promise to me. Gotta lift those eyes up to God! The Lord knows our destiny better than we do. His forcing us to wait for the good things He has promised I compare it to a child waiting for chocolate chip cookies to finish baking. We dream about filling our mouths with the sweet flavor of the cookies, but when we ask for them we are told not yet. Waiting for something you want very much feels like an eternity. Every minute we ask if they are ready, but it is always the same answer: “Not Yet.” As we wait, there are two things we can do; we could become bitter over the waiting and try something else to satisfy us (maybe candy); or we could go into the kitchen with our Mom, watching her every move, hoping that she will go to the oven and take out the cookies. This principle also applies to wait for God’s provision. We could either draw close to Him or turn away. However, if you turn away, you might spoil your spiritual appetite and the thing you wanted won’t be as sweet. On the other hand, if you stay close to God, you learn His ways and you would be right there when the provision is given out. I don’t know about anyone else, but I think waiting with God is far worth the wait. Absolutely! It’s a matter of trusting God’s judgment more than our own having the faith to believe He sees us and has our best interests in mind. This is a beautiful message, Susan! I remember seeing a quote that said, “Faith in God includes faith in his timing.” I too have had my fair share of waiting. The very worst was when my dad had a stroke and fell down an escalator. He was on life-support and we waited ten days to take him off of it. As terrible as that time was, I saw God’s grace and mercy the whole time. Can you imagine what God was doing while you were waiting! But if you weren’t trusting God, but instead wrapped in anxiety it could have left you jaded. Such a great message! God is getting me ready for an even better thing! I’m waiting in anticipation and learning all I can in the “wait.” God is so good! Beautifully said. I have been struggling with waiting for a specific prayer most of my life. I know in my head waiting on His timing is crucial but my heart fights against it. I fight to bury it but that only results in my heart turning to stone and I want a heart of flesh (Ezk 36:26). What I am doing while I wait is the key. Where I am focusing is where my heart goes also. This post blessed me beyond measure. Thank you and praise Jehovah-rappha. This made me mist up! I can clearly see that God is doing a transformational work in your heart as you go from glory to glory, bearing His image. The pain is exquisite, but the rewards are eternal! Thanks for sharing your heart. How do I know if what I’m waiting on is a God desire or if I’m just selfishly wanting something that God doesn’t even want for me to have? I am struggling with this same question. I feel in my heart that I have to wait and the scriptures I receive after praying makes that feeling stronger only for people to tell me that they don’t feel it is God’s will for me to wait or that Satan is misleading me with the scriptures or that they interpret them differently etc, etc, etc. This is really making me question my waiting, my praying and my initial belief in what I felt was right. Also, in your circumstance when you need extra clarity, I would introduce fasting in the mix. Even if it’s just for a day. Fasting makes you grouchy and feel unspiritual, but it will soften your heart toward God and often helps you hear His voice better. What you need is an encounter of His presence. Seek His face in worship. Clear your mind and meditate on Him alone. He will speak to you and bring clarity. Last night this question kept filling my mind and I prayed about the words of people and what they feel and believe. I prayed about this among other things including the aspect of my life I am waiting on. After praying I opened by Bible and came upon the following scripture: Ezekiel 2:6 “Son of man, do not fear them or their words. Don’t be afraid even though their threats surround you like nettles and briers and stinging scorpions. Do not be dismayed by their dark scowls, even though they are rebels.” I will keep on praying for even more confirmation and clarity. God has His hand on you for sure, Cassie! well said, there is a thing that am waiting for ,that to happen for me. i always complain and feel pain about it sometimes ,but your written here gives me something , something i have been missing in this time of waiting , some people says ” if you wait long for something, you are waiting for the big and better , and that comes from GOD ”. as you said we have to be ready foe the big moment , and GOD is prepared us to that moment, when that moment comes he will grant us with lots of joy with it! i thank you for the inspiring and eye opener blog , may GOD bless you! p.s. please don’t mind my English am not that good. and one more thing i guess u got it wrong on the verse that you took from the bible from the book of prophet Isaiah, instead of Isaiah 40;13 is should be Isaiah 40;31. i thought it might help dear. GOD BLESS ABUNDANTLY! Thank you for this message! I’m in a waiting time right now and this is a great reminder. Wow, I really needed to hear this today!! Thank you!! It is very tempting to give the issue to God and then want to pick up again. We always believe we can handle it better. Great post. God, I thank you that your ear is not closed to our prayers, but you hear and are moved with compassion! I ask that your hand would be on these boys and that you would direct their paths. I ask that they would not wander from your ways for long, but that your sweet spirit would draw them to you. I pray for peace for mama (and all mamas!) as she prays and waits for their return, and I ask that Christ would be formed in her as she looks to you and not her circumstances, trusting in your goodness, love and divine foresight over her own inadequate power. Thank you for your goodness and faithfulness Amen! I have had to do my share of waiting. Among other things, I have been dealing with a property ownership situation for over 10 years. At times I grow tired of it. I know I got myself into it, and only God can get me out of it. Have I learned anything from it? You bet. Sometimes God may also be using the situation for other people’s benefit, not just our own. So, we may truly never know all of the reasons for our wait (at least during our life here). We just have to trust that He’s got it under control. Good point! It’s not always about us. Wise words. Thank you so much for this! A good reminder! God has our backs.. no doubt about it! Yes! He knows so much more than us! God works in mysterious ways! 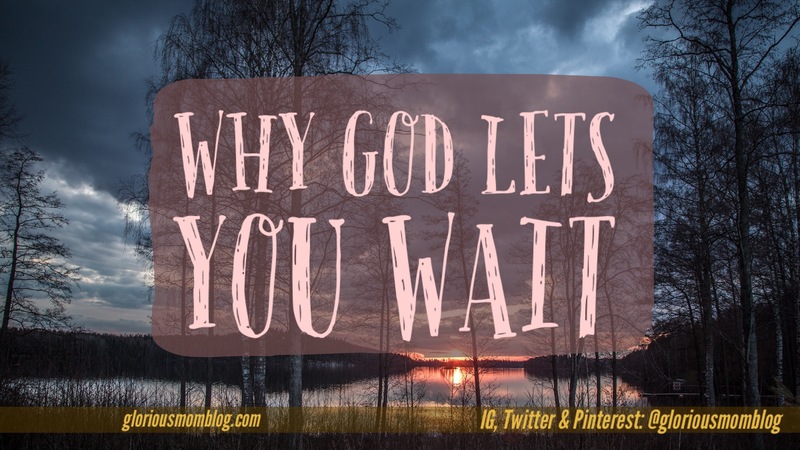 I opened my Pinterest on this Monday morning with a heavy heart, only to find a link to this post with the words “why God lets you wait,” staring me right in the face. This is exactly what I needed to hear today! All my life, I’ve wanted nothing more than to be a wife and a mama. When I was in high school, I watched five of my friends become pregnant and have babies. Though I knew deep down that is not what I should want for myself, I couldn’t help but feel slightly jealous. Today I am 25 years old and God has blessed me with a wonderful husband and our first home together. We have been married for over a year now and desire to start our own little family. We have been trying to conceive for 2 months with no luck. Each time we receive a negative result, my heart breaks. I’m full of worry and anxiety and fear of infertility…. I’ve been trying so hard to put it all in God’s hands. I know that God’s plan is better than my own. I’m just struggling. Please pray for us! Tearing up over this!!! I know God has his hand on you and is forming your heart through the pain. A friend of man was struggling with fertility also. She ended up adopting a beautiful baby boy, then when he was still an infant she got pregnant! Unfortunately, she lost the baby, but months later got pregnant again and just delivered a beautiful baby girl a few weeks ago! This lady was the former worship leader at our church and had the whole church praying for her. I will pray for you that God grants you the desires of your heart. The Lord remembered her petition,in the process of time a baby was born to her,she named him samuel. (1Samuel1;19-20).,Nevertheless she will be saved in childbearing if they continue in faith,love and holiness with self control. (1Timothy2;15),May God bless you sister with a beautiful baby,you will be conceived shortly by His grace. This was such and encouragement for me . My husband left almost 3 years ago and has filed for divorce . It has not been granted yet because of him not providing some of the needed documentation( this in itself was an answer to prayer for me . It’s been a hard journey for me BUT I can honestly say I’m thankful because instead of knowing about God I KNOW Him now ! I feel he has spoken to me that restoration is coming even if the divorce goes through . I am truly learning to let go of the situation . Unfortunately I still worry about it . I need to keep my eyes on God like you said . Satan likes to keep us looking at the circumstances to discourage our prayers . 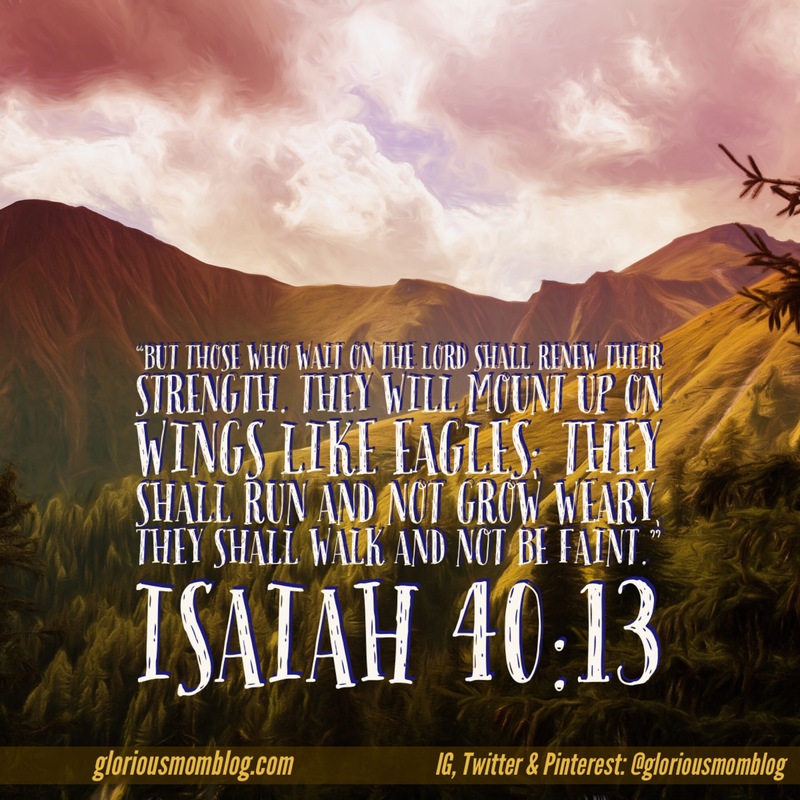 I know God is moving on the other side of the mountain ….whether I can see it or not ! Thanks for this great reminder ! It’s definitely God’s heart to see you restored to your husband! I will agree with you in prayer!